Head Of Shrek's Studio Puts Millions Behind Obama Some two dozen Americans have given $1 million or more to superPACs in the 2012 presidential campaign. The vast majority of them have been Republicans, but Jeffrey Katzenberg, the head of DreamWorks Animation, has chipped in $2 million to help out the superPAC supporting President Obama. Dreamworks Animation CEO Jeffrey Katzenberg, shown at CinemaCon 2012, has donated $2 million to the pro-Obama superPAC Priorities USA Action. Some two dozen Americans have given $1 million or more to superPACs in the 2012 presidential campaign. The vast majority of them have been Republicans, but one movie mogul has chipped in $2 million to help out the superPAC supporting President Obama. Jeffrey Katzenberg, the head of DreamWorks Animation studios, was also the co-host of Obama's sellout event Thursday night at the home of actor George Clooney. Katzenberg told the crowd the event raised nearly $15 million, which would make it the most profitable presidential fundraiser ever. "Once again the entertainment industry has stepped forward in a very big way," Katzenberg said, according to The New York Times, and mentioned presidents John F. Kennedy, Ronald Reagan and Bill Clinton as others who enjoyed Hollywood largesse. Katzenberg is well known in Hollywood circles. If you haven't heard of him, you've probably heard of his studio's blockbuster properties, like Shrek and Kung Fu Panda. 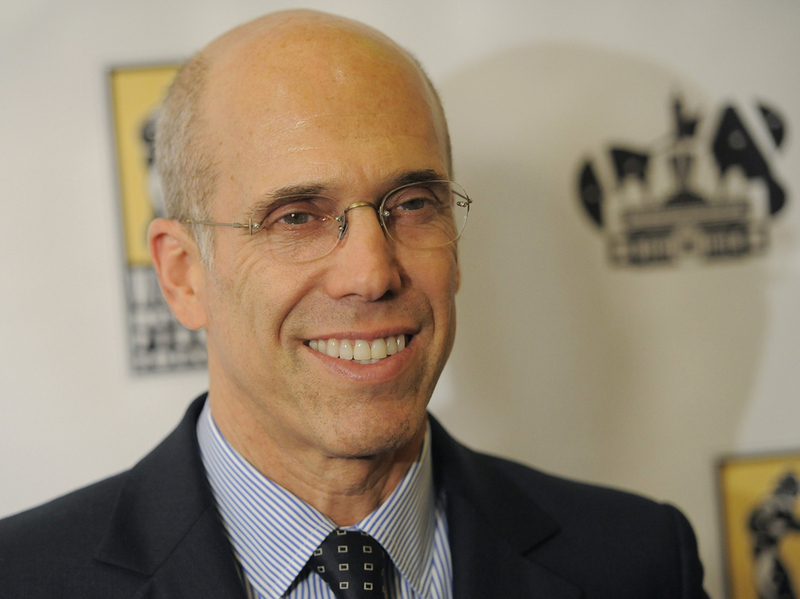 Katzenberg made his millions in movies, but his first career was politics. In the 1960s, he worked on John Lindsay's mayoral campaign in his native New York City. Katzenberg was in charge of campaign events. He was the advance man — or perhaps the advance teen. He was only 19 at the time, and the campaign staff called him "Squirt." "Because he's little, and he was a kid. He was a punk," says writer and author Steven Brill, who also worked on Lindsay's campaign as a teenager. "Jeff has an unbelievable work ethic. Everything always got done, everything always got done on time or ahead of time, and he was just always working." Many on the staff went on to long political careers, including speechwriter Bob Shrum and Sandy Berger, President Clinton's national security adviser. But Katzenberg said he didn't see much of a future in it for himself. He told Charlie Rose in a 2010 interview he had topped out: "For my age, there really wasn't going to be a new challenge in politics. And so I sought out ... a new career." That new career was movies. Katzenberg took his organizational skills to work in some of Hollywood's biggest studios: United Artists, Paramount, Disney and ultimately DreamWorks, where he is CEO. Along the way, he and his wife have donated millions to political and charitable causes. Katzenberg was honored for his philanthropic work at a movie industry convention last month in Las Vegas. Actress Cameron Diaz heaped on the praise. "He is persistent not only about things relating to work, but he is also persistent about things related to worth," she said. Katzenberg likes to talk about his charitable work. He doesn't like to talk about his politics. He turned down repeated requests for an interview. According to the Center for Responsive Politics, he has given more than $3.5 million since 1979. In the 2008 campaign cycle, he was the second highest individual donor, always giving to Democrats. His $2 million check to the Priorities USA Action superPAC last year put him in the top 10 donor list this cycle — an elite group of U.S. multimillionaires and billionaires. 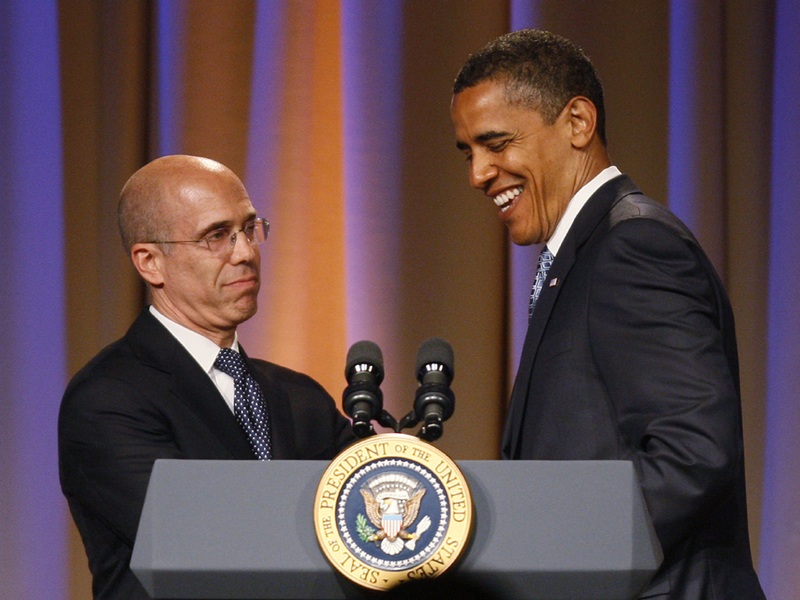 Katzenberg introduces President Obama at a 2009 Democratic National Committee fundraiser in Los Angeles. Marge Tabankin, a Hollywood activist and fundraiser who does not work with Katzenberg, says the DreamWorks CEO wouldn't be a good businessman if he didn't play in high-stakes politics. "But you don't need to work at the level of Jeffrey Katzenberg's energy and commitment to these causes and issues, unless you really believe in them," she says. "It's beyond what a businessperson does." Earlier this year, Katzenberg the businessman got some quality face time with one of China's top leaders, who was in Los Angeles with Vice President Joe Biden. Katzenberg and other Hollywood studio heads have been lobbying for better access to China's huge movie market. Just before Chinese Vice President Xi Jinping left L.A., the White House announced China would allow 14 more foreign films into the country each year. That's as long as the movies are IMAX or 3-D — something Katzenberg's DreamWorks makes plenty of.